Neo Prophet was built on the ample foundations of Neo-Prophet (mind the hyphen!). 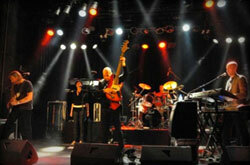 Back in 2005, four experienced Belgian rock musicians joined forces, creativity and enthusiasm. Founded by Hans Six (aka 'Mac6') on vocals and bass, with Rudi Lins on drums, Sjoerd Bruyneel (aka 'CAP') on keyboards and joined shortly after by Frank Debruyne on guitars, Neo-Prophet was born. Their varied blend of 'Classic & Progressive meets Sympho' - Rock was first heard on the demo 'The Feeble mindedness of the Inept and the Ignorant', produced by Hans in his own WAMP-studio. 2006-2007 was mainly used to compose new and stronger material, and to test it out during several smaller, local gigs, which finally resulted in the full CD "Monsters" in early 2009. The album was recorded in the course of 2008 in the famous ACE Studio, and was produced, mixed and mastered by the equally famous Frank van Bogaert. Thus, the full potential of the band was revealed to the rest of the globe, with an album that was highly acclaimed by fans and press alike. This resulted in a small tour, with live performances across Belgium, the Netherlands and Germany (eg. Symforce [NL]). Due to musical differences, Rudi was replaced on drums by Wesley Jaques (aka 'Wes') in 2009. One year later, Geert Annys (ex-Mystery) took over the axe-position from Frank. The Rest of 2009-2010 was mainly spent composing new material for the follow-up album, and trying it out on a few live gigs. Unfortunately, even though 80% of the new material had been written, Sjoerd suddenly decided to cease his activities in Neo-Prophet in early 2012. Pieter van den Broeck, aka 'Pete Mush' (Quantum Fantay), keyboard player and producer in his own Mushroomland studio in Lokeren [B], is happy and eager to fill up the vacancy behind the keys and on backing vocals. Tom Tas, guitar animal 'pur sang' and well known by Pete, is excited to join the band on guitars. 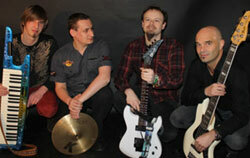 Mark III is re-born early 2012, which sees the band re-dubbed 'Neo Prophet'. All earlier-written material was thrown in the trash bin, and Hans, Pete, Tom and Wes, with their different backgrounds (Classic-, Space-, Prog-rock, Metal and even Acoustic/Singer-Songwriter) start writing the album 'TIME' from scratch, with new, stronger, and more varied material than ever. The first recording sessions start in the summer of 2013, both in Pete's Mushroomland and in the well-known ACE studio (again with Frank van Bogaert), with a release due sometime during 2014. Stay tuned!